Palmako Melanie 10.7m² The Palmako Pavillion Melanie 10.7m/sq Summer House is a larger two roomed log cabin featuring 28mm wall planks. The Palmako Pavillion Melanie 10.7m/sq Summer House has classic styling and can be built as shown in image or in reverse - i.e. mirrored to image shown above. The smaller room is ideal for all uses including storage of garden tools and outdoor furniture, barbecues, bikes and children?s toys during winter months whilst the larger room offers an ideal extension to your living space. As well as being a practical two roomed log cabin the Palmako Pavillion Melanie 10.7m/sq Summer House are a very attractive feature in the garden. Review - On the whole, good quality components but dreadful instructions. When I called to ask for help, they said "well the instructions 'kind of do' say that" and they clearly do not. If you can afford it, get it professionally erected. Shingles a must, felt would very much cheapen what is overall a nice summerhouse. On the whole, good quality components but the instructions sort of let it down! If you can afford it, get it professionally erected. 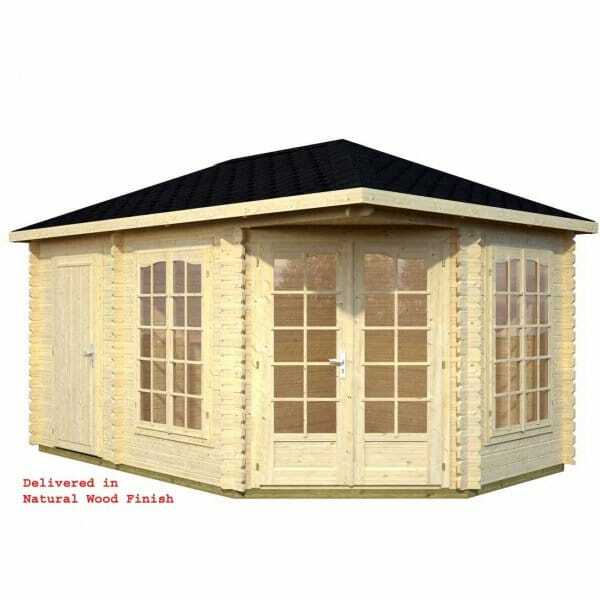 Shingles a must, felt would very much cheapen what is overall a nice summerhouse.